With their low running costs and increasingly long ranges, more and more people in the UK are buying electric or hybrid cars. Whether you want to help save the planet or money on fuel, it’s well worth seeing if an electric car or hybrid is right for you. You might have heard the terms ‘electric’ and ‘hybrid’ car a lot, but have no idea what the difference is between them. On top of that, there are several types of hybrid cars to get your head around too. And unhelpfully, quite a few people call hybrid cars electric cars… just to confuse matters further. What’s the difference between an electric car and a hybrid car? The main difference between an electric and a hybrid car, is that a hybrid car gets some of its power from a ‘normal’ combustion engine, fueled most of the time by petrol, and very occasionally diesel. An electric car (EV) is a zero emissions (ZE) vehicle, as it gets all its power from electric sources. EVs run on electric power alone, and are charged with electricity. You do this via a charging cable (most of the time – things like wireless charging are on the way), which draws power from a wall socket or dedicated charging point. The electricity in the car is stored in batteries, before electric motors use it to drive the car’s wheels. Find out more about the benefits and downsides to owning an electric car. What are hybrid cars and what are the different types of hybrid car? If we’re talking about hybrid cars, it generally means a car with a petrol engine and electric motor. So, the car uses both electricity stored in batteries, and the fuel from a tank to make the car move. In some cases, the petrol engine’s sole use is to recharge the batteries which power the electric motors. In other hybrids, the petrol engine drives the wheels directly, but you can also get some zero-emissions driving from the battery/motor combination. Find out more about the benefits and downsides to owning a hybrid car. A mild hybrid system isn’t powerful enough to drive the wheels by itself, but instead, it assists the engine in one of several ways. For example, in some Suzuki models, the company’s ‘SHVS’ (Smart Hybrid Vehicle by Suzuki) system helps the engine during harder acceleration, and makes the stop-start system smoother. Some Audis have a mild hybrid system which lets the car’s engine be turned off for short periods of time while coasting, and starts it again when you accelerate. Other mild hybrid systems shut off the engine when the vehicle is stopped, braking or coasting. However, because you can’t run a car on electric power alone, CO2 emissions aren’t as low as they would be on a plug-in hybrid or electric car. When you think about a hybrid car, your first thought might be a Toyota Prius. It’s probably the best known one out there. This is a parallel hybrid. The car’s wheels can either be powered directly by the electric motor alone, by the engine, or by both working together. The Toyota Prius uses its electric motor at speeds up to 15mph, and while pulling away, but it only has an all-electric range of 1.25 miles. When you use the brakes or decelerate, the regenerative braking system in the car also produces electricity and stores it for later. The name of this one gives it away a bit. A plug-in hybrid can be plugged in to recharge its batteries. It can also be charged on the move through regenerative braking. This is halfway between a hybrid and a full-electric car. Plug-in hybrids have a ‘normal’ engine and batteries, but they can drive longer distances on electric power alone. This is usually between 15-30 miles. With a range extender hybrid, the cars have a small petrol engine as well as the battery. However, the ‘normal’ engine is only used as a generator, to produce electricity that recharges the battery, rather than to drive the wheels. One example of this would be the BMW i3S. The small petrol engine gives the car an extra 90 miles of range compared with the regular i3. You might hear the term ‘range anxiety’ a lot if you’re researching electric cars, and it is still a significant barrier, if not the biggest, when it comes to considering whether to buy an electric car or not. 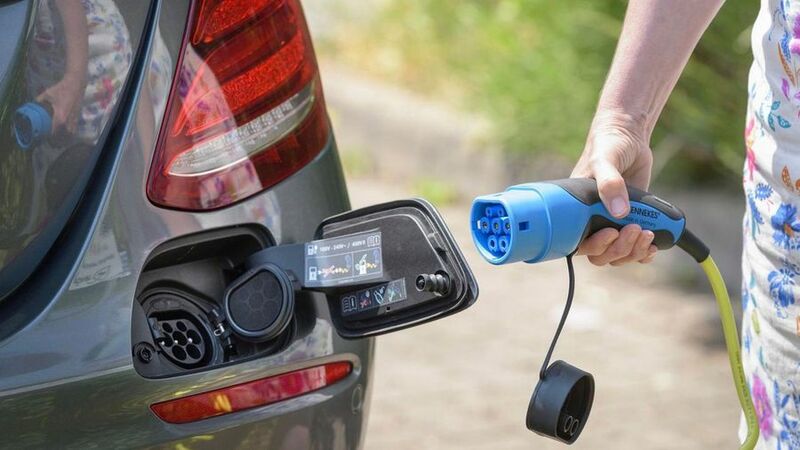 Range anxiety is the worry or fear that when you’re driving an electric car, the battery will run out of power before you get to where you’re going, or to a charge point. While electric car ranges are constantly increasing, it can still be a concern, especially on a long journey. If you’re looking for an electric car with the longest range, you’ll be looking at a Tesla. The Tesla Model S has an official range of 259, 315, or 335 miles (depending on which model you buy); the Tesla Model X has a range of 237, 289, or 295 miles; and the Model 3 has a range of 220 or 310 miles. Of the more mainstream and affordable electric cars, the Renault Zoe has the longest range, with an official range of 250 miles – which should see you around 185 ‘real-world driving’ miles in the summer, and 124 miles in the winter.